Soulpepper opens its first season comprising only 20th- and 21st-century plays with Accidental Death on an Anarchist (1970) by Italian Nobel Prize-winner Dario Fo. Fo’s plays blend the improvisation of commedia dell’arte with modern political satire. This is not a dramatic combination that is easy to master. The current Soulpepper production goes so far in revving up the comedy that it has to separate out the political commentary into a non-comic lecture, a move completely contrary to the mixture that Fo intended. Anarchist is based on the case of the Italian railwayman and self-confessed anarchist Giuseppe Pinelli, who was accused of bombing a bank in Milan in December 1969. After three days of questioning, Pinelli fell from the fourth floor window of the Milan police station and died. The police claimed he committed suicide. Others claimed he was pushed. An investigation cleared Pinelli of the bombing and the police of responsibility for the death. The police chief in charge was later assassinated in retaliation for Pinelli’s death. In Fo’s play a Madman (Kawa Ada) has been arrested by police for impersonating a psychiatrist. The Madman explains that he has a mental condition that forces him continually to play different roles, a malady that would be useful on the stage but not in real life. Frustrated with the Madman’s tomfoolery, Inspector Bertozzo (Oliver Dennis) gives up on him and leaves the Madman alone in his office. When the phone rings, the Madman answers on behalf of Bertozzo. Inspector Pak (Ins Choi) has called to warn Bertozzo that a judge is coming to the station to investigate the suicide of an anarchist held in their custody in December of the previous year. Armed with the case files that he steals, the Madman decides to impersonate the judge and investigate the death himself. Under pretense of trying to help the police Chief (Rick Roberts) and his men escape prosecution, the Madmen gets the officers to explain the many discrepancies between their first and second statements of what happened the night of the suicide, all the while incriminating themselves even more. Fo called the play a “grotesque farce about a tragic farce” and any good production has to take the double nature of the material into account. No matter what buffoons the police may seem to be, they are still the villains that threw an innocent man out of a window and then tried to cover it up as suicide, Fo’s point is that it takes a mad man to expose such a crime since the sane man in real life did not. Ideally, our laughter should be mixed with outrage at the nonchalance of the police at having committed and concealed such a crime. Jain has forgotten one of the prime rules of farce, which is that no matter how funny the actions of characters may be to the audience, to the characters themselves they are deadly serious. In fact, the more seriously the characters take their situation, the funnier it is. Here from the first Kawa Ada’s Madman, much given to mugging, plays almost more to the audience than he does to anyone on stage. This self-consciousness destroys the atmosphere of seriousness that should reign among the characters on stage and is vital for our perception of the policemen’s essentially malevolent nature. Yet, Jain so anxious to make the show funny he turns the policemen into lovable halfwits. This reaches a climax at the end of Act 1 when he has the Madman and three policemen sing “Solidarity Forever” in four-art harmony. The problem is that the more stupid the police appear, the more their stupidity exculpates them from the crime. As if realizing that he has helped dissipate the anger that should be present in the show, Jain adds a scene in Act 2 that is not in the play and contrary its point. A Journalist (Raquel Duffy), has just summarized the Madman’s argument in saying: “It appears that even when there is no scandal, it's necessary to invent it because it's a marvellous way of maintaining power by providing an escape valve for the offended conscience of the masses”. At the point Kawa Ada refuses to say his line about scandals and then steps out of character and off the stage to lecture the audience about how Canada has become a puppet of the United States, how police killings of men of colour happen in Canada too and how the media encourages focussing attention on frivolous scandals involving individuals like Rob Ford or Jian Gomeshi because it distracts us from the real scandals of what the government is doing such as opting out of the Kyoto Accord, loosening gun control and restricting personal freedom. This lecture is basically an equivalent to the “in-case-you-didn’t-get-it” speeches that conclude typical middlebrow plays where the points that the action should have made are summed up at the end in a tidy take-home speech. Far from making the play more effective, the presence of this lecture suggests that the entire action preceding it has been defective in making Fo’s political points clear. In fact, it reveals not that the play is defective but rather the direction that has not married laughter with anger as Fo intends. What happens, of course, is that once Ada finishes his lecture, the audience sighs in relief that the preaching has stopped. The action of the play resumes and the lecture is forgotten as soon as we get back into the plot. The production of Anarchist that remains my touchmark for the play was directed by Robert Delamere for the Donmar Warehouse in 2003 starring Rhys Ifans as the Madman. Soulpepper’s current production struck much of the audience as hilariously funny, but, unlike the Donmar production, it left me only fitfully amused. One way in which the Donmar production was superior is that Ifans, unlike Ada, played the Madman as if he were actually mad while Ada comes off merely as a garrulous entertainer. With Ifans there was always a hint of danger. Similarly, the policemen were not jovial idiots but thugs from whom the Madman was able to cajole to reveal ever more damning evidence of their wrongdoing. The threat always loomed of what might happen if they should finally see through the Madman’s charade. 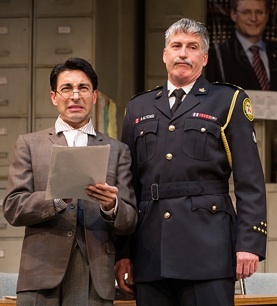 In Soulpepper’s production neither the Madman nor the police generate an atmosphere of danger, an important flaw since danger heightens comedy. When Bertozzo tries to tell the other policemen who the judge really is, the other three policemen use slapstick routines straight from the Three Stooges to shut him up. Jain’s direction turns what should be a political satire into merely a wacky physical comedy. Yet, taken as such one must admit it is well done. Jain sets the action on breakneck pace, so fast, in fact, that we miss some of the revelations about the police cover-up. The entire casts’s split-second timing is impeccable even if the sound effects cues are not. There is no doubt that Kawa Ada is talented but he requires firmer direction. His character, the Madman, may take on various disguises, but he changes nothing else to create a new character to suit the new disguise. Oliver Dennis’s gift for comedy is well known and it is a pleasure to see him as Bertozzo though rather unexpected to see him involved in so much slapstick. The surprise of the evening is Rick Roberts as the Chief of Police. With his cowlick popping up like miniature rabbit ears, Roberts exhibits a real flair for madcap comedy, and singing, that he has never had a chance to display before. As Inspector Pak, Ins Choi is also funny but more circumspect while Paul Sun-Hyung Lee with is dry delivery is unfortunately underused as Officer 1. Daniel Williston makes a good impression as Officer 2, and Raquel Duffy, no stranger to comedy at Soulpepper is right at home as the dirt-digging Journalist. It’s not clear why Lorenzo Savoini has created a set that underlines the play as a play. Surely, the contrivances in the text are so great that point is well established. Yet, Savoini’s set, occupying on the centre third of the Baillie Theatre stage, allows us to see the bare 2x4s on the other side of the painted walls representing the police offices. We see the bricks of the theatre’s back wall and when actors exit we see them walk through the open space on either side of the set to sit in a chair or leave the stage through another door. The cleverest use Jain makes of this deliberately artificial set is when there is a change of scene in Act 1 from an office on the third floor of the station to the office on the fourth floor directly above it. To signal this, Jain merely has Savoini’s backdrop of the Toronto skyline lowered about eight feet. The audience on opening night seemed to be evenly split between those who found the production riotously funny and those who found it a lot of silly noise and bother with a little sermonizing added to suggest something important was going on beneath all the froth. It’s good to see Soulpepper explore a different form of comedy, but it doesn’t yet have the grasp on Fo’s mixture of biting satire and farce the way is does on the very different comedies of Alan Ayckbourn, Samuel Beckett, Eugene Ionesco, Joe Orton or Ferenc Molnár. Those who have never seen Anarchist before may enjoy its general zaniness. But those who have seen a good production before will know that Fo’s comedy can and should be much edgier and more unsettling. Photos: Rick Roberts, Ins Choi, Kawa Ada, Raquel Duffy and Paul Sun-Hyung Lee; Kawa Ada and Rick Roberts. ©2015 Cylla von Tiedemann.